The MS-21, which is also often referred to using the Cyrillic alphabet as MC-21, is Russia’s first post-Soviet airliner and represents a determined effort to regain the country’s standing as a center of aerospace engineering prowess. 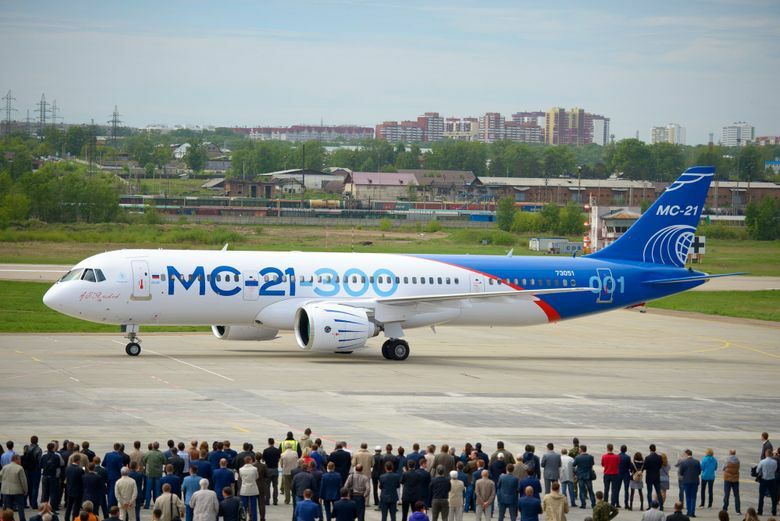 Less than a month after China’s national aerospace champion offered its challenge to Airbus and Boeing with the first flight of a 737-sized airliner, Russia entered the fray Sunday when jetmaker Irkut flew the MS-21 for the first time. It features a carbon fiber reinforced plastic wing and tail, as well as the latest Pratt & Whitney geared turbofan engines, similar to those on the Airbus A320 and Bombardier CSeries jets. The flight was not announced in advance. 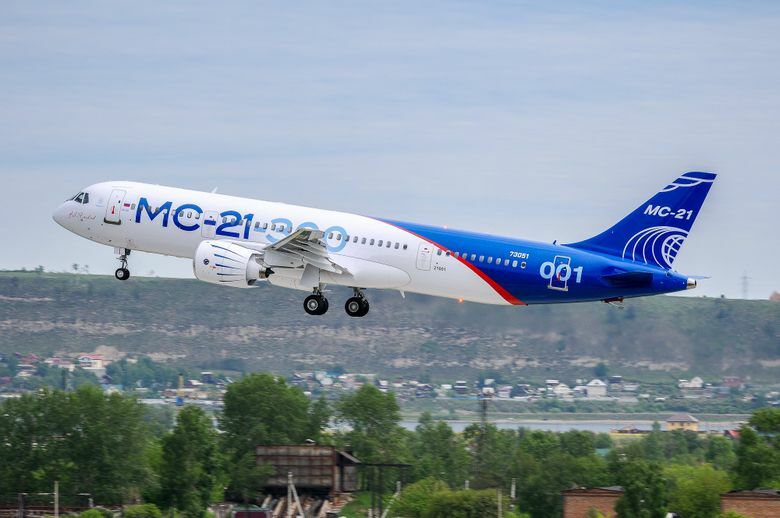 Irkut said in a statement that the larger of two proposed variants, the MS-21-300, successfully completed its flight in Irkutsk, Siberia, flying for just 30 minutes, reaching an altitude of 3,300 feet and a speed of 186 miles per hour. The shortness of the flight and the relatively low speed and altitude could indicate some issue arose to cut the test flight short, but in its statement Irkut insisted all was normal. The Russian jet enters the same market as the Chinese C919, which had its debut flight in Shanghai on May 4. Designed to carry 163 to 211 passengers, the MS-21-300 — like the C919 — is aimed at the heart of the single-aisle market, today dominated by the Airbus A320 and the Boeing 737-800. Its fusleage is four inches wider than that of the Airbus jet and a full foot wider than Boeing’s, offering the possibility of wider seats and better passenger comfort. The MS-21 is also slightly longer than either of the Western aircraft, and it has an extra seven inches of wingspan. Yet data provided by independent Russian aviation sites indicates that the plane’s composite plastic wing and tail make it more than 3 tons lighter than the Boeing 737. The composite wing is not produced the way Boeing manufactures the wings of the 787 Dreamliner — by baking the material to hardness in a high-pressure oven, known as an autoclave. Instead, Irkut uses a technology called Resin Infusion that hardens the composite without the enormous energy and capital investment required for the autoclave process. The 21 in the MS-21’s name designates it a “21st century” aircraft. “MS” is for Magistralni Samolyot, meaning airplane for mainline or backbone routes. Irkut, a division of Russia’s state-controlled United Aircraft Corporation (UAC), has been tasked by President Vladimir Putin with restoring the country’s aerospace industry to its former pre-eminence and challenging the West’s dominance. Russia is also developing its own PD-14 jet engine, which it plans to offer as an alternative on the MS-21 to the Pratt & Whitney engine. The aircraft has won 175 initial firm orders from Russian buyers. It’s likely to sell more not only within Russia but within those countries of the former Soviet Union still dependent on Moscow. But can it sell well in the West? To do so, UAC will have to build an extensive support infrastructure to supply maintenance and spare parts for Western airlines — a tall order starting from scratch. Irkut’s ability to streamline the resin infusion technology to efficiently ramp up production will also be critical to the jet’s chances of success. 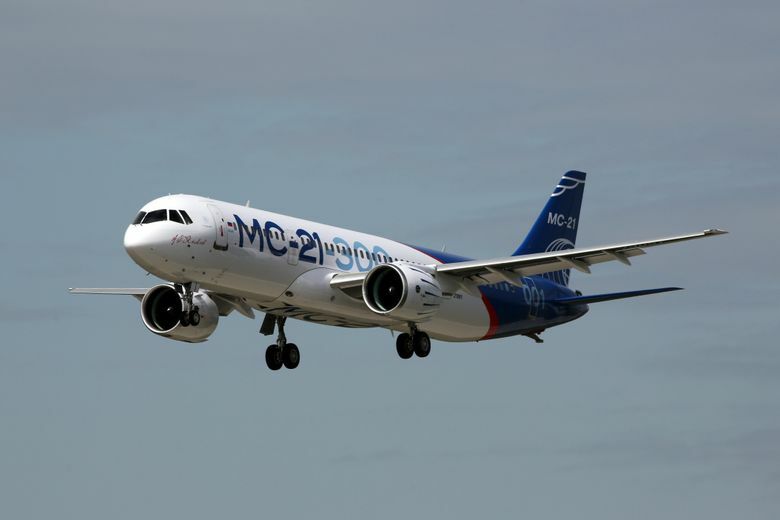 In a report published Monday, U.S. aviation consulting firm AirInsight wrote that “if the MC-21 turns out to meet its specifications, then UAC has a fine product on its hands that may further disrupt the duopoly” of Airbus and Boeing. The challenge to the two Western aircraft makers is not so much to the new Airbus A320neo and Boeing 737 MAX single-aisle jets. Both of those are established successes, with Airbus having already stacked up more than 5,000 orders for the A320neo while Boeing has just over 3,700 orders for the MAX. But if the MS-21 gains a foothold in the market and sells well enough to survive, then looking a decade ahead the next new jet from Russia could be more of a threat. Earlier this month, Russia and China together announced a new joint venture to develop over the next decade a larger, twin-aisle airliner in the same size category as the Boeing 787 Dreamliner and the Airbus A350.